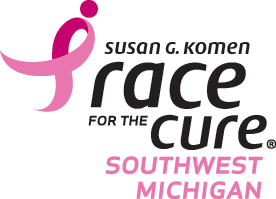 KALAMAZOO, MI – January 7, 2016 – The 2016 Southwest Michigan Race for the Cure®, locally presented by Premier Radiology, will celebrate its 20th year as part of the Susan G. Komen Race for the Cure Series – the largest, most successful education and fundraising event for breast cancer in the world. The 2016 Race, to be held on Saturday, May 14 in Kalamazoo, will continue to hold many of its annual traditions including special activities for survivors, sponsor giveaways and live entertainment, but will also feature new elements including access to the Growlers’ Kidz Zone area complete with a bounce house and fun games for children, a chance to ride the Growler’s new zip line, photo opportunities with the Growlers’ mascot, Porter, and a few more surprises that will be revealed on Race day. Also, anyone who registers for this year’s Southwest Michigan Race will receive a ticket to the Growlers opening night game on Friday, June 3rd as well as a pink Growlers baseball hat. For more information or to register today, visit: www.KomenMichigan.org/SWRace16. To learn more about Komen Michigan funded breast health programs in Southwest Michigan, visit: www.KomenMichigan.org/grants. Special thanks to the 2016 National Race Series Sponsors: Bank of America, American Airlines, Ford, New Balance, PR Nutrition, SELF Magazine and Walgreens.